Amazon announces that it will buy Whole Foods Market for $13.7 billion and panic ensues in the retail markets. Shares of Walmart, Target, Kroger, Dollar General, and Costco tumble immediately. 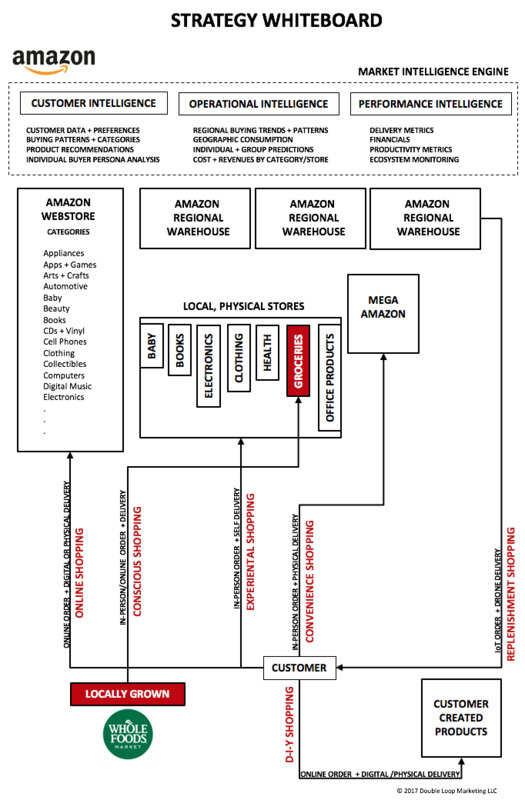 Amazon will now have a physical bricks and mortar footprint to complement its digital ecosystem. 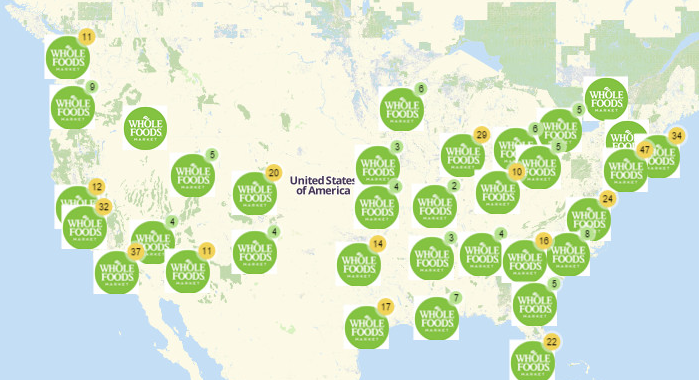 Whole Foods has over 450 physical locations across the country, with a blueprint to scale to 1200. Amazon will surely expand on this, and bring a new local presence that will destabilize the establishment grocers like Krogers, Safeway, Sprouts, Wal-Mart, Costco. 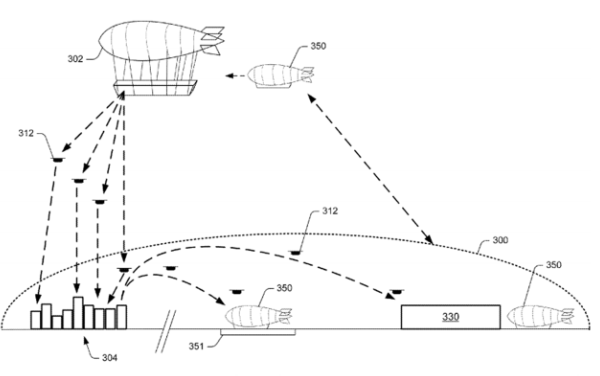 Now Amazon will be selling perishable goods, and use its technology to cut costs and overhead. By acquiring Whole Foods, Amazon has also acquired a coveted high-end customer segment – the conscious consumer. 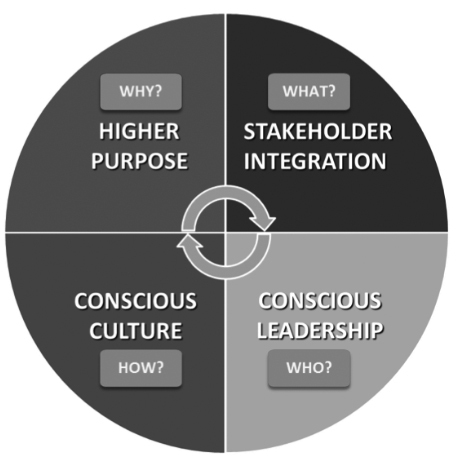 According to Raj Sisodia (co-author of a book with Whole Foods Market cofounder John Mackey) Conscious Capitalism is not a business strategy or business model. It is a comprehensive philosophy of doing business. Too many businesses generate financial wealth at the expense of social, cultural, environmental, intellectual, physical, and spiritual wellbeing. They are extracting value rather than creating value. Conscious Capitalism is about doing business with a spectrum of positive effects, not having one positive “main” effect and many negative “side” effects. Conscious businesses spend money where it makes a positive difference. They don’t waste money on unnecessary advertising, gimmicky promotions, and the revolving door of high employee and supplier turnover. They empower people and engage their best contribution in service of a higher sense of purpose. They make a net positive impact on the world. This includes the affluent, organic lifestyle demographic – folks who don’t buy based simply on price (the opposite of the Wal-Mart shopper). 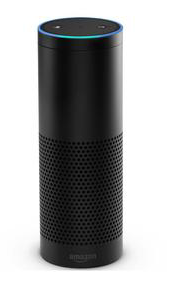 Steve Wozniak has already endorsed Amazon Echo as the next big platform for e-commerce. 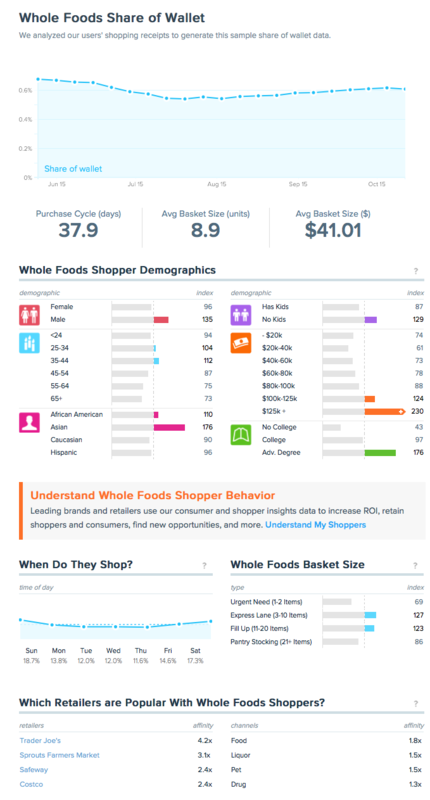 Now, with Whole Foods, Echo is set to become the “one-click” shopping for physical goods. In over 20 cities, Echo already enables restaurant orders and delivery. The Echo will also be connected to the Amazon “airborne warehouse” of the future. The “Death Star” of e-commerce, indeed. 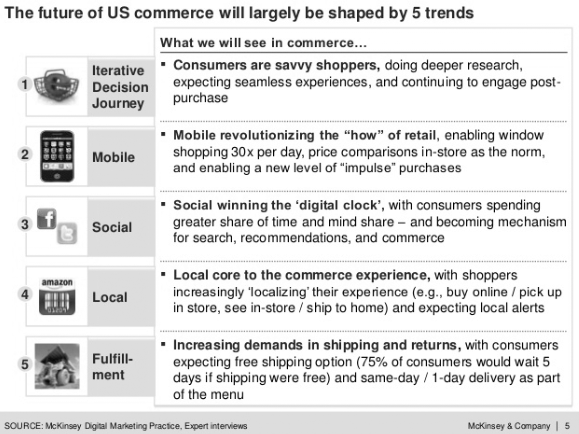 The Future of US Commerce will be shaped by these 5 trends, according to McKinsey’s Brian Gregg . The only one of these that Amazon was missing out on was “Local.” That is no longer an issue. Now, with Amazon’s AI and recommendation engines, backed up by real-time customer demand data, we will see a new level of optimization based on individual preferences. None of the other retailers come close. Soon, Amazon will be the undisputed king of micro-moments. Leadership. 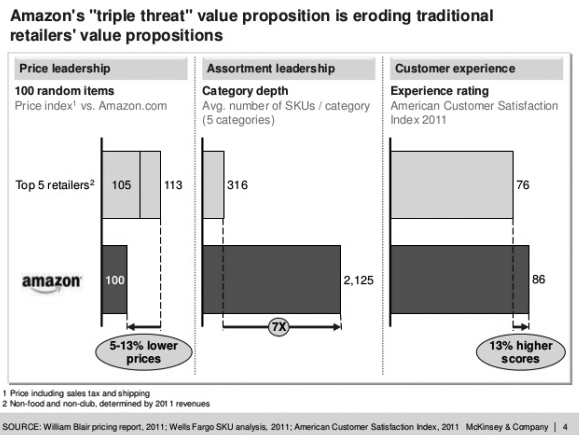 Amazon is already a “triple threat” value-proposition leader, according to McKinsey. Acquiring Whole Foods will give it a fourth leadership opportunity. Amazon has blocked the high-end of grocery retail. Only Sprouts and Trader Joe’s serve the same demographic. Whole Foods is now under the umbrella of one of the world’s largest and most impressive logistics companies. 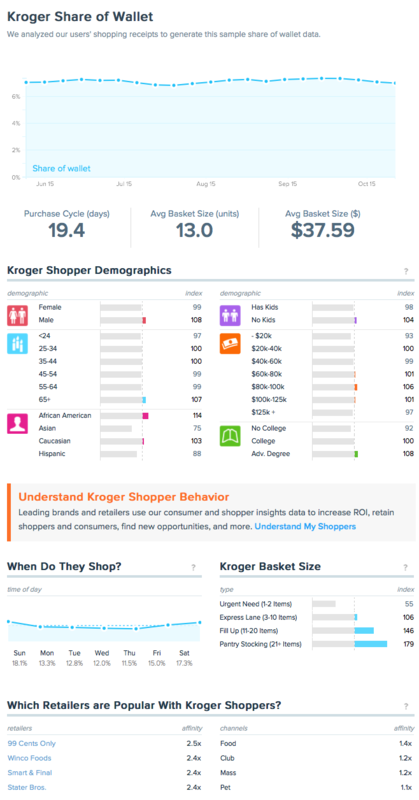 While the grocery chain has (slowly) caught up to competitors when it comes to internet ordering (it outsources much of it to the shopping service Instacart), it’s lagged in managing its labor force efficiently, and lacks the size or negotiating power to demand the best deals from suppliers. As an Amazon subsidiary, it won’t have those problems. With Amazon Prime, Bezos unbundled the shopping cart and made shipping a fixed cost. Now, Prime members buy without concern for additional shipping costs. The result? Customer orders go from a drip to a steady flow! Let’s look at Amazon Dash, a Wi-Fi connected device that reorders your favorite product with the press of a button. Each Dash Button is paired with a product of your choice, which is selected through the Amazon App on your Android or iOS smartphone during the set-up process. Marketers should view every device as a channel to better understand the customer. Now, Prime comes to the physical world. Expect Amazon to promise Prime members that their grocery order will be delivered in an hour or less. Also, note the recent addition of Prime for low-income households at $5.99 per month. 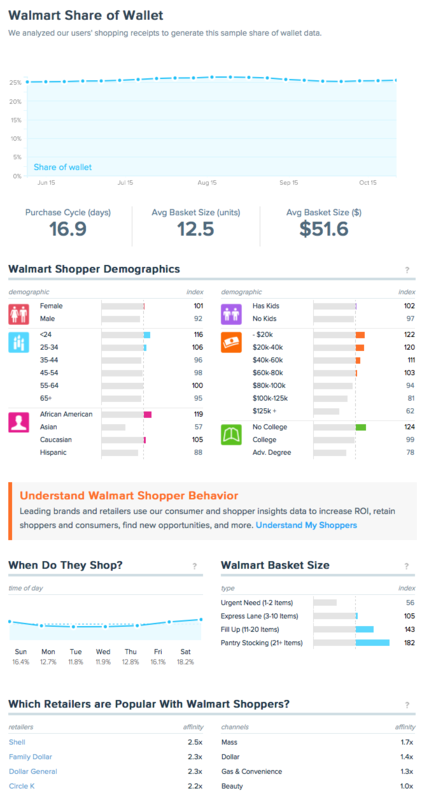 This is a significant attack on Wal-Mart, which will only intensify with physical retail stores. The jury’s still out on this, but, there may be real hope for those living in a grocery desert. 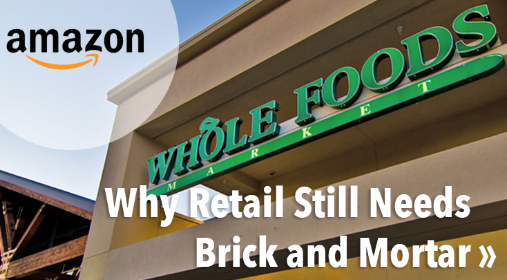 Suffice to say, the Whole Foods acquisition changes the retail world – beginning with groceries – forever. Stay tuned for the next announcement. Will Amazon buy Macy’s? Christian Sarkar is the editor of this site, an entrepreneur, consultant, and activist.